It’s big. It’s beautiful. It’s … not at all practical as a mobile controller. 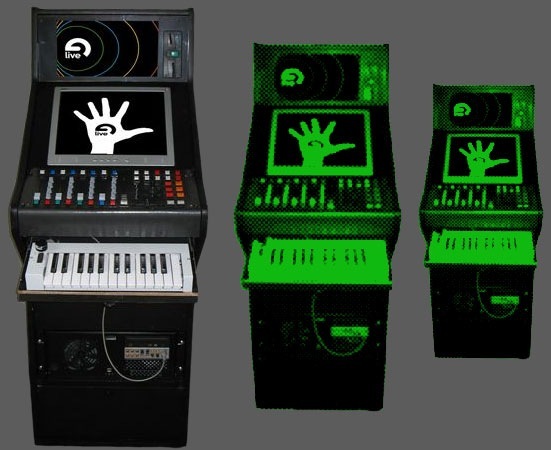 It’s the Abletonator: Ableton Live on a PC with custom controller and casing, transformed into an arcade game cabinet form-factor. Why? Because. (Thanks to comments by Gavin for the tip!) So, if you liked the Ambassador Live controller with arcade buttons, but wanted a full cabinet so it’s impossible to lift, you’ll love this. You actually can get Jr Savage to make one of these bad boys for you, for about GBP2500. “Coin-op electro shock.” I love it. Off-topic, but fun if you like arcade cabinets: our friends at Retro Thing show off a Doctor Who Tardis DIY project, and a video of building their own cabinet if you want to try this yourself.